Winning the Numbers, Losing the War on Poverty? The Philippines is in a worse poverty situation in 2010 than when it started on the MDGs in 2000. We are losing the war on poverty. Many would still be left behind, and their numbers are simply staggering by any count. SWP has been producing citizens’ reports on the MDGs through the support of the United Nations Development Programme (UNDP). 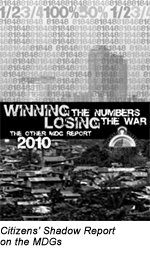 The title of the 2010 shadow report was “Winning the Numbers, Losing the War: The Other MDG Report 2010”.The coverage of the Shadow Report included poverty and hunger; education; women and gender; infant and child health; maternal health; combating HIV/AIDS and other communicable diseases; environment; global partnership; and Bangsa Moro (Muslim) perspectives. Through the Shadow Report, the citizens’ groups provided input into the annual planning and budgeting processes, from top to bottom or from the ground up, and the administration’s six-year blueprint. The MDG Shadow Report aimed to help create a Medium-Term Development Plan (MTPDP) and local development plans that are truly MDG-sensitive and committed to deliver on the minimalist MDG promises: an MTPD that is able to build our country’s adaptive capacity and resilience to worst-case scenarios arising from multiple crises of food, fuel, finance/economy, and climate change. A copy of the MDG Shadow Report was submitted to President Benigno Aquino III before he attended the UN Millennium Summit in New York. Social Watch Philippines wrote him a letter saying that the people’s groups are hoping that the President can use the MDG Shadow Report when he represent the Filipinos during the UN Millennium Summit because the report echoes the voices of the ‘voiceless’ who are living in poverty and are at the margins of social protection. The poor are hoping that lives will be better with new administration. To ensure that no one is left behind on the Millennium Development Goals (MDGs), citizens and local government units (LGUs) must work together to ensure that the delivery of MDG-related socioeconomic services actually reach the grassroots and that it brings about sustainable development in the communities. In the Philippines, those who are being left behind are the women and children. The country’s official data showed that in terms of magnitude, the largest numbers of poor are among children and women. To help address this problem, the United Nations Millennium Campaign (UNMC), in partnership with Social Watch Philippines and the Philippine Rural Reconstruction Movement – Albay Chapter (PRRM-Albay), developed a social mechanism that empowers every citizen to be actively involved in reporting on and monitoring delivery of social services, particularly on maternal and child health. This involves the use of communications technology to strengthen citizens-government collaboration to help local government units effectively deliver the necessary health services to the grassroots. This allows citizens to maximize text messaging using cellular phones as an effective tool of active citizens’ participation in ensuring that every mother and child receives proper health care from their governments. Text messaging is very popular among all classes of society and is being extensively used by the rich and poor alike. It follows a global initiative piloted by the UNMC in Kenya and launched in India.